X055ML Digital Security Safe is rated 4.4 out of 5 by 7. 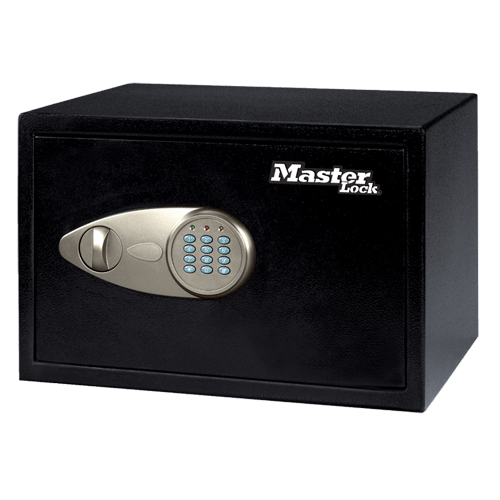 The Master Lock Digital Security Safe X055ML is equipped with a pry-resistant door and two live-locking bolts to provide added security for your irreplaceable belongings. 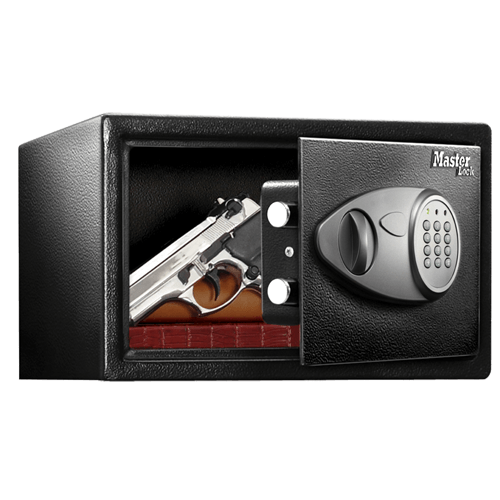 This safe also includes a custom carpet interior to keep your important valuables protected from damage during storage. This battery-powered digital locking system uses a programmable 1-8 digit code. Multiple user options vary by model. Live-locking bolts provide advanced protection against theft and unauthorized users. Ensures your fragile or delicate valuables are protected from scratches. Offers added protection against attempted break-ins. Ensures thieves cannot easily remove the safe from your home or office. Rated 4 out of 5 by mjwh from Handsome & Easy to Use I like the size of the case but would like to have shelves as an option to allow for better organizing in the unit. Rated 5 out of 5 by stan008 from Strong and easy to use safe Safe is easy to place and bolt down. Spacious to fit important documents without need to bend them. Rated 2 out of 5 by Smokepipe from Not so great I could open it with a hammer This safe has a cheap sheet metal case, a plastic front where the combination lock is, and a plastic key! a couple good wacks with a hammer and it would be open. Also, shipping materials kept the same door from opening during setup. I had to struggle to get the safe door open after unpacking. This product is good for keeping things away from prying eyes, but not so great for true security for valuables. Rated 5 out of 5 by Kickyr from Good Value Nice place to keep valuables and medicines (for safety). I mounted on the wall in a closet. Very easy to setup and use. Rated 5 out of 5 by Fred1223 from Secure and strong What I like is the number combo AND key override. So far I like it a lot. I’ll love it once I get it mounted down. Rated 5 out of 5 by Luis from Great strong yet compact design Love the safe. Perfect size for what we need in our home.